A federal wild horse roundup in Utah’s West Desert is drawing fire after four injured horses were put down and photos surfaced showing helicopter wranglers swooping down as some of the galloping animals ran into barbed wire fences. 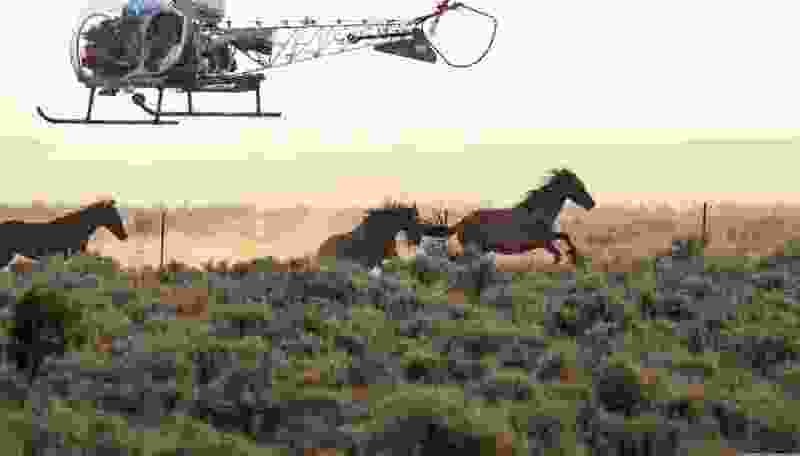 Photos shot Monday by an observer affiliated with the American Wild Horse Campaign depict one horse tumbling hard, hooves in the air, after striking a fence as a chopper hazed a band toward a trap, according to the photographer, Steve Paige. The four euthanized horses were suffering from pre-existing injuries, according to Finch. This month’s Utah roundup is the latest in a series the BLM is staging around the West to remove horses that officials say exceed the capacity of the lands they occupy. It targeted five adjacent horse management areas in Beaver and Iron counties west of Milford, collectively known as the Bible Spring Complex and Sulphur, whose horses numbered 1,400. Photo by Steve Paige, courtesy of American Wild Horse Campaign. 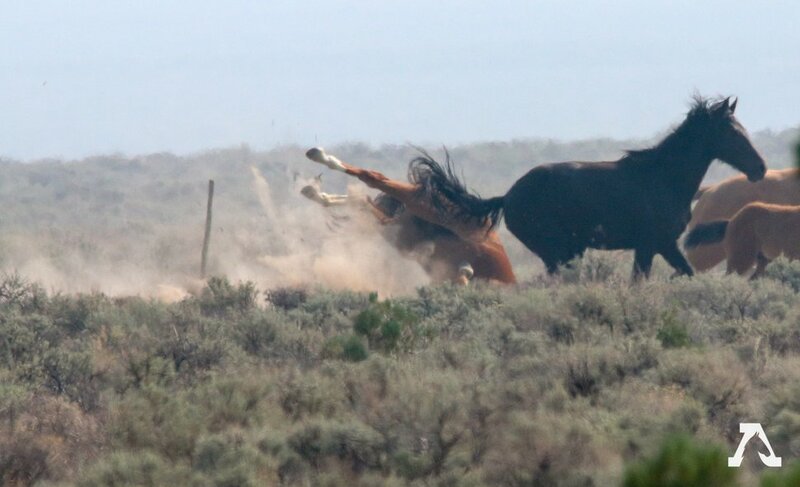 A wild horse tumbles Monday after striking barbed wire during a roundup in Utah's West Desert. Horse advocates castigated the Bureau of Land Management's helicopter contractor for engaging in practices they say recklessly endangered wild horses being removed from public lands this month. The gather concluded Wednesday after the removal of 250 horses, 50 over the number the BLM had originally targeted for removal. These horses were sent to the BLM’s corral in Delta, where officials plan to adopt out as many as possible, although it is likely most will join the thousands of others held in on-range pastures for life. In contrast with past Utah roundups, no horses are expected to be returned to the range. There is universal agreement that the never-ending cycle of horse removals is not sustainable because they do nothing to keep the population growth in check and add to the inventory of horses already being warehoused for life at a cost of more than $50 million a year. U.S. Rep. Chris Stewart, a Republican whose district covers much of the state’s wild-horse territory, is advocating more frequent roundups and surgical sterilization of mares that would be returned to the range. Stewart repeatedly has noted that the West’s wild horses and burros far exceed the 27,000 the BLM has established as the “appropriate management level." He says many horses are starving on the range, their numbers depleted by drought and overgrazing. After a town hall-style meeting last week in Salt Lake City, Stewart touted his proposed reforms, saying a broad “consensus” supported them. But many horse advocacy groups deeply oppose sterilization. They argue that ovary removal puts mares at risk of infection because there would be no post-surgical care on the range and permanent sterilization disrupts horse bands’ social order. Most advocacy groups prefer increased use of the noninvasive contraceptive called PZP, but Interior Secretary Ryan Zinke has dismissed its efficacy, which is temporary lasting only a year or two, and the practicality of inoculating thousands of mares over the course of their lives.